The era of paper maps and compass is over...maybe. Consider this: in December 2014 Alaska adventurers Luc Mehl and Roman Dial ice skated 100 miles in two days from Selawik to Kotzebue. That's cold, Alaska wilderness. Their only navigation tools where two iphones loaded with routes, maps and images. No paper maps. No compass. No battery packs. No solar panels. Okay, I admit that paper maps and compass work great. In the past I've navigated wilderness and whiteout for thousands of hours without a problem. 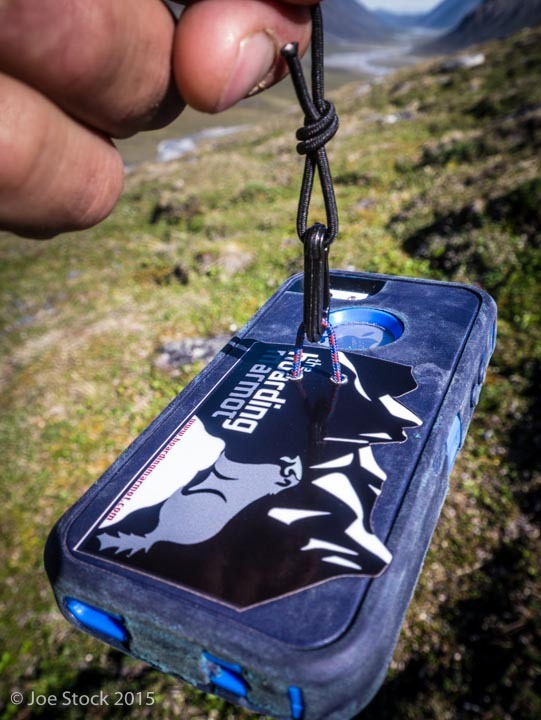 As much as I wish smartphones and their apps would disappear, they are the new reality, especially for a guide who is trying to stay current. In talking with Luc, Roman and mountain professionals such as Mark Smiley and Henry Munter, the best tools for route planning and backcountry navigation are Google Earth and the Gaia GPS app. I hope this tutorial will help you get started. My neighbor and friend Luc Mehl planning his annual spring ski trips in Alaska. 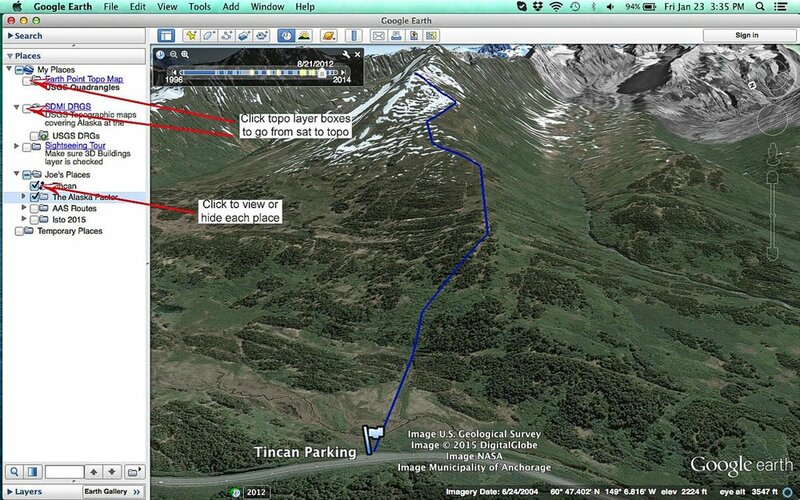 Prepare the route on Google Earth. Download Gaia GPS maps to phone. Luc's Navigation with Gaia GPS tutorial. Mark Smiley's Gaia and Google Earth tutorial. First, download the latest version of Google Earth onto your computer. 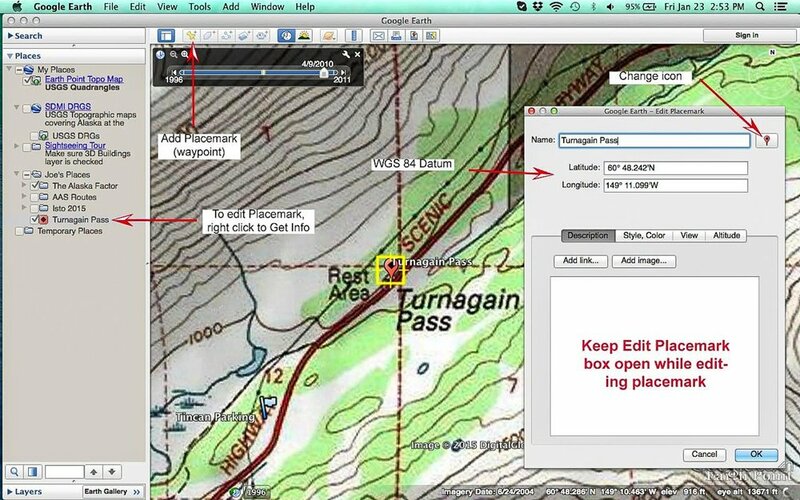 Then download a topo layer and install it into Google Earth. Go to Earth Point (www.earthpoint.us/topomap.aspx) and click on the View in Google Earth tab to download. Open the file in Google Earth. Make sure to drag it from Temporary Places to My Places in Google Earth, or else the topo layer will disappear after you close Google Earth. 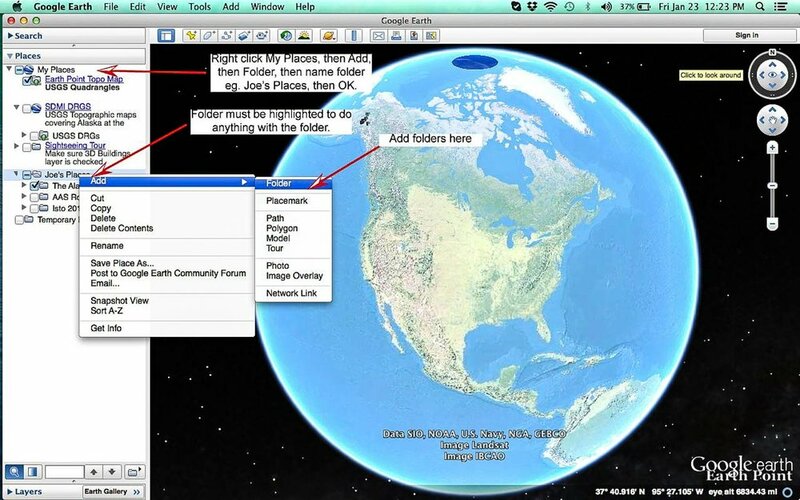 Organize your Google Earth trips by creating a file in My Places. To create a route, highlight your new folder (Joe's Places), click the Add Path icon. Keep the New Path box open as you click each waypoint. Resume drawing by clicking a new anchor on the route you're drawing. The start and end of the route don't join. To remove points: click on the route, then click delete or right click. To add a waypoint (called Placemark on Google Earth), right click the folder where you want the waypoint located, when Add and Placemark. Double click on waypoint to home in. To add a waypoint at a known lat/long, type it into Get Info. .kml = is the full file, save as .kml to upload to Gaia or another GPS device. .kmz = is the zipped file, best for sharing among other Google Earth users. Select the files you want to sync and select the Toggle Sync button. If the files don't load onto your phone, then sync from your app by toggling the Sync/Backup button on-off. This is my favorite option because it is easy and fast. Email yourself the .kmz file, press and hold that .kml attachment in your phone email. Open in Gaia. Here's a video tutorial. Do this at Max Zoom before you go into the field. To download maps for a route that's on your phone, go to tracks, select the track, then download maps for track. Phone: keep your phone warm, near your body or stick a foot-warmer to it. Phone: keep in airplane mode, gps still works in airplane mode. Phone: turn off Wi-Fi, Bluetooth and Cellular. Phone: settings, battery, low power mode. Gaia: do not record route. Gaia: No GPS Until Activated on in settings. Gaia: Disable Altitude Lookup on in settings. Bring external battery with cable. The distinguishing feature of Gaia compared to other navigation apps is the ability to toggle between topo and sat layers in the field. A GaiaPro subscription ($4 per month, $40 per year) allows you to view various map layers simultaneously with adjustable transparency. I'm right here. I'm sure. My dumbphone says so. Hot wax your ski climbing skins so they don’t glop.